Winter Hill Stone, Keighley Moor. Cup-Marks on Winter Hill Stone. of great reverence in pre-historic times; the cup-marks being carved in the Bronze Age. To get to this stone it is “best” to follow the footpath opposite the small carpark, on Buck Stone lane, close to Wainman’s Pinnicle, then head in the general direction of the Hitching Stone, but after some 460 yards (at the little wooden gate) veer off to the south-west and, a further 380 yards brings you to Winter Hill Stone, close to the western edge of the moor overlooking the hamlet of Over Dean. The village of Cowling is 2 miles to the west and Cross Hills a further 4 miles north along the A6068 road. 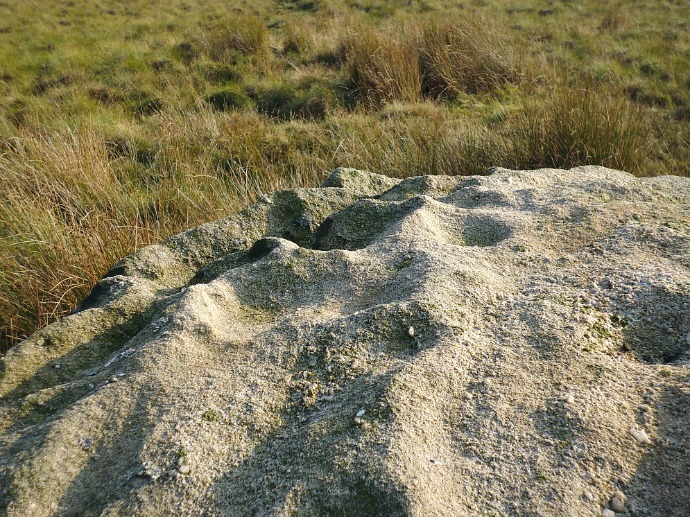 This large rounded, weather-worn stone is quite prominent upon the flat-shaped Winter Hill, but sadly the cup-markings around the stone’s base are now much less prominent – indeed some of them are barely legible to the eye. 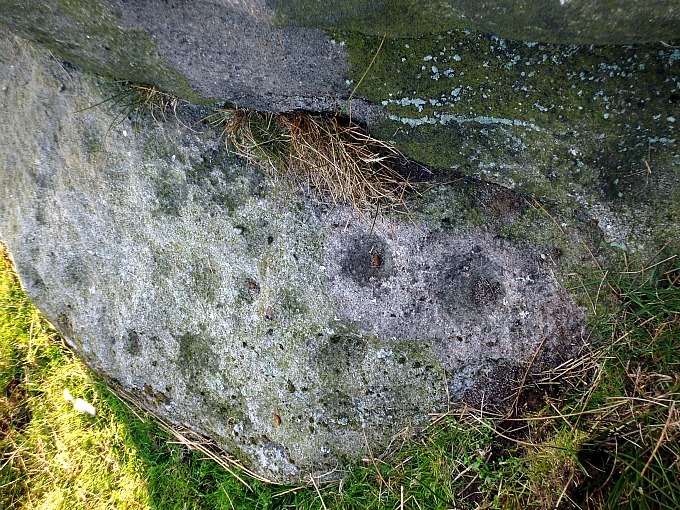 There are at least 17 tiny cup-marks that are eligible, the rest are very faint, but on the top of the stone more cup-marks are quite well-defined, indeed over time they have become deeper and wider due to the constant weathering; the strange grooves and ruts are also the result of erosion to the soft gritstone. The hill on which the boulder stands is ‘so named’ because the winter sun can be seen to rise from [here] behind the Hitching Stone over to the north-west. 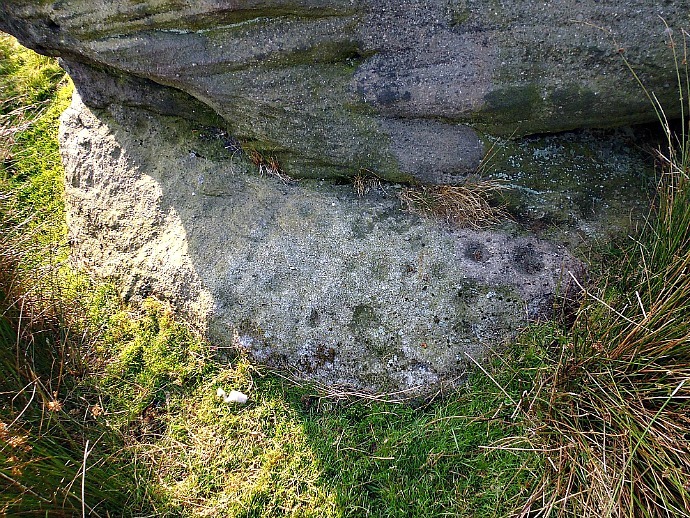 There are many, many other boulders and stones littering the moor, one or two also look as if they “might” have very faint cup-marks on them. In particular, a boulder some 380 yards to the south-west of Winter Hill, looks a likely candidate. It is highly likely that there were ancient settlements somewhere on the moor, but obviously these are now hidden beneath the thick, dense carpet of ferns and heather which seem so relentlessly to have taken over. The Hitching Stone (Os grid ref: SD 9866 4170) is a huge glacial erratic block of gritstone the size of a small house that was deposited here at the last Ice Age. It reputedly weighs over 1,000 tonnes. Large fissures run vertically through the rock, one of which was caused by a fossilised tree that has worn away; while one side of the rock bears a large oblong-shaped hole that people climb into. There are some Victorian inscriptions on the stone while at the top a deep natural basin containing rain-water that is never known to dry-up, even in long dry spells of weather. Long ago local folk visited the stone in order to participate in various games, and the site was also a meeting place for local councils and parliaments – Bennett ‘The Old Stones of Elmet.’ The Hitching Stone stands on the Yorkshire-Lancashire boundary. And in the interesting little book ‘The Pendle Zodiac’ by Thomas Sharpe we are told that the Vernal Equinox sunrise behind the Hitching Stone is in alignment with Pendle Hill. Sharp goes on to say: “Where natural markers (and even some of these have pecked ‘cup and ring’ markings) are absent, the ancestors would have incorporated standing stone monoliths to time the alignments and to receive into the landscape, etheric vitality from the luminaries.” Pendle Hill beacon is roughly 14 miles, as the crow flies, to the south-west of Winter Hill Stone and Hitching Stone. 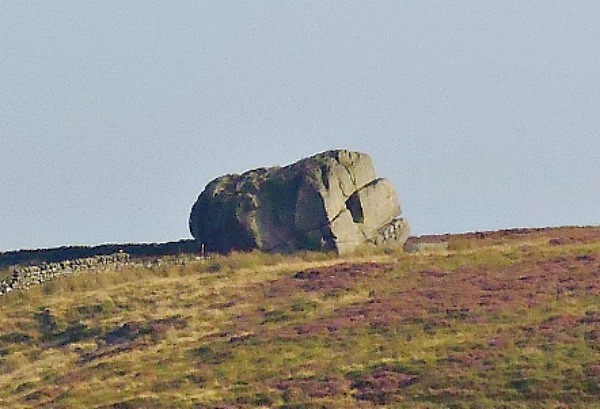 These large gritstone boulders on Keighley Moor were laid-down thousands of years ago at the last Ice Age by a massive glacier moving southwards, and retreating as it did so. Over time the boulders (erratics) themselves are slowly weathering-away due to the often wet, windy climate upon the moor. Nowadays, however, these strange, often round-shaped boulders and stones have become waymarkers and sentinels that seem to loom-up on the barren, unforgiving landscape, taking one by sudden surprise! Bennett, Paul., The Old Stones of Elmet, Capall Bann Publishing, Milverton, Somerset, 2001. Sharpe, Thomas., The Pendle Zodiac, Spirit Of Pendle Publishing, 2012. Categories: Cup-And-Ring Markings, Glacial Erratic | Tags: Hitching Stone on Keighley Moor in West Yorkshire, Winter Hill Stone on Keighley Moor in West Yorkshire | Permalink.